...but in January I was manically packing and getting my full-time job into good shape so I could leave it for India, where I was for almost all of February, and now I'm back, but I'm still unpacking and doing laundry and catching up at work. In the meantime, I do tweet about the films I'm watching here and post silliness about 1950s–80s Bengali cinema at Bongalong (co-authored with Indie Quill and various other contributors [which could include you if you watch Bengali cinema of the same vintage and have something amusing and/or interesting to say about it]). A post you might be interested in on that site is a photo essay in which I detail why I hate the character of Devdas, using screencaps from the 1979 Bengali version that stars a mostly unconvincing 41-year-old Soumitra Chatterjee as Devdas and Uttam Kumar as Chunilal. Very little that was truly filmi occurred on my travels around India, but I'll write something up once I have figured out what photos to use. 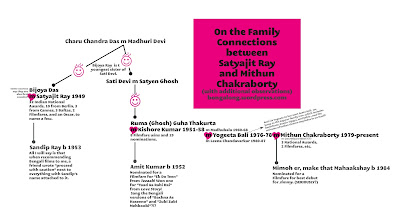 And on Friday—which was the 15th, so beware the Ides of March, seriously—I discovered that Satyajit Ray is related to Mithun Chakraborty through marriage (and divorce)...and that this same chain of people hooks into the Kapoor family tree (which is detailed in an earlier blog post here—and do read the comments, they're fascinating), at which point the universe implodes in on itself. Up soon: the Mukherjees (Rani, Kajol, Tanuja, Joy, Deb, etc.). Can somebody hook either the Farah Khan/Javed Akhtar family or the Feroz/Sanjay Khans into this? That would really be something. Click here for a larger pdf. Hi Sujayita - Thanks for the link! I have that book in my library list but haven't gotten to it yet.